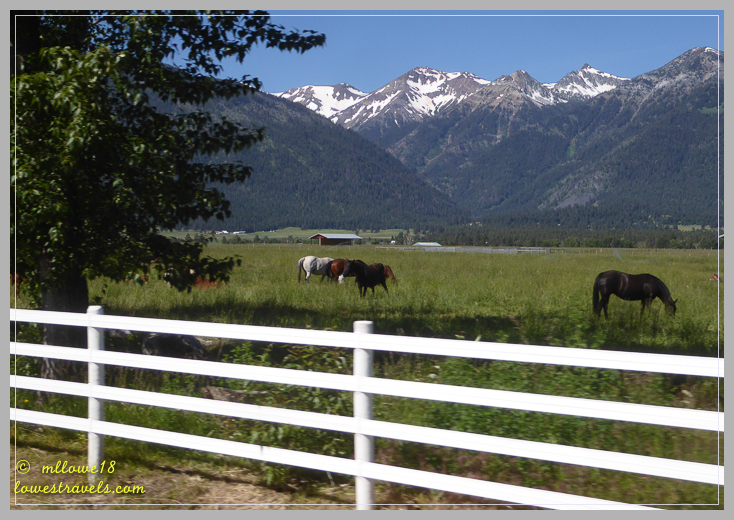 From Idaho we crossed into the far northeast corner of Oregon, with our sights set on the towns of Wallowa County – Joseph, Enterprise, Lostine, and Wallowa. 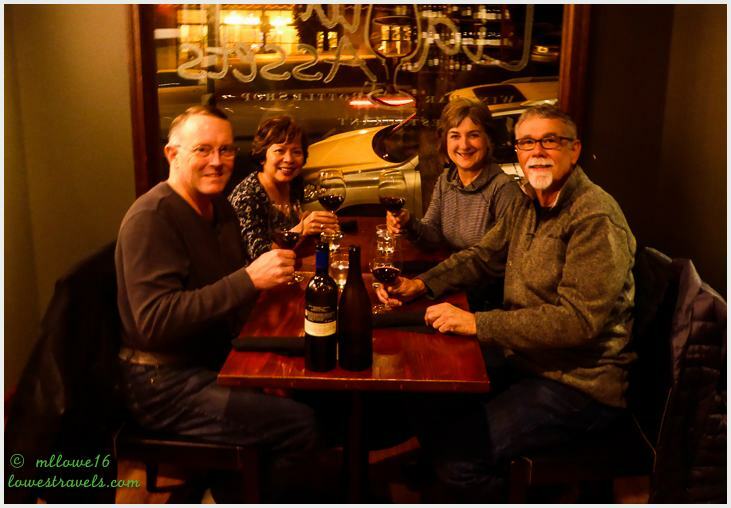 When making our reservations in January we wanted to stay in the small town of Joseph, about which we’d heard great things. 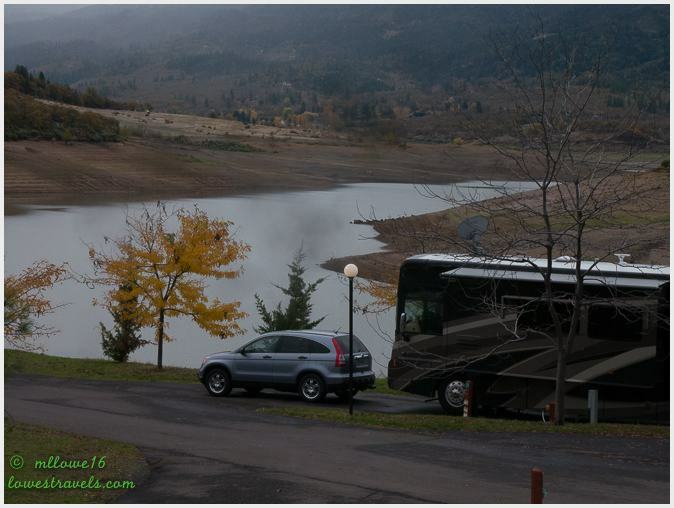 But apparently a lot of other folks had heard great things before we had, so with everything booked up there we ended up at Wallowa River RV Park in the little town of Wallowa. 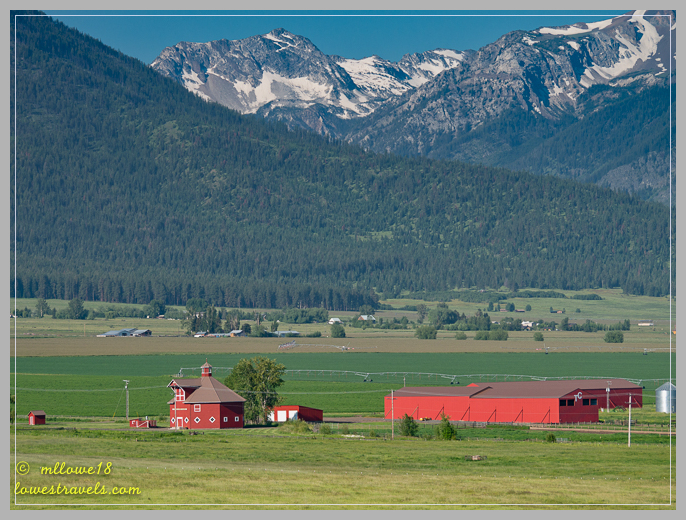 Although it meant we had to drive at least 25 miles to enjoy most activities in the area, our “commute” included Wallowa Valley, beautiful farmland, cool barns and wide-open skies – all against the backdrop of the jagged Wallowa Mountains. 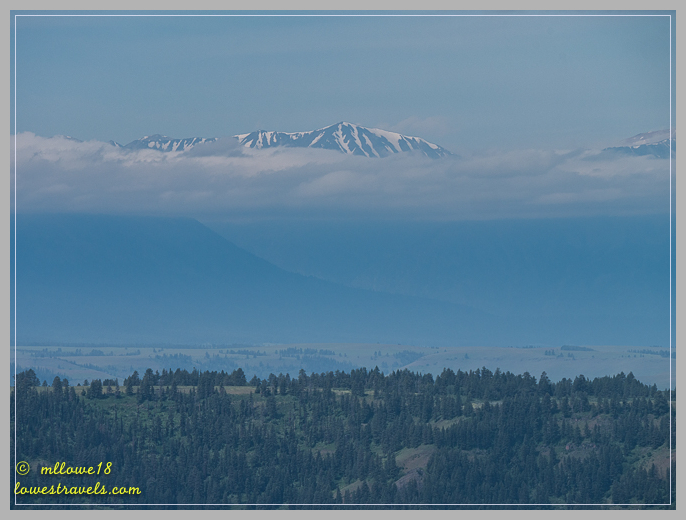 The Wallowa Range has been dubbed the “Swiss Alps of Oregon”. Although we haven’t made it to Switzerland yet, we’ve seen pictures and could understand the comparison while driving along I-82. 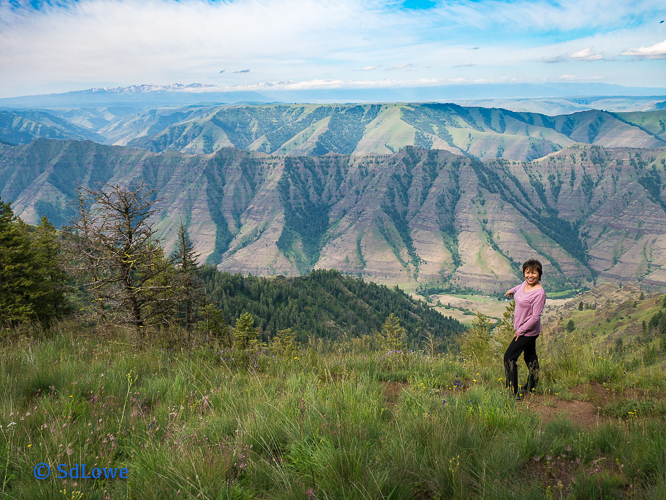 The range resides in the Nez Perce region (meaning “land of running waters”), and is home to 17 mountains that eclipse 9,000′. The Eagle Cap Wilderness features almost 360,000 acres of alpine peaks, meadows and lakes in the heart of what’s known as the Oregon Alps. With so many things to see and do, our one-week visit had us on the move every day. That prompted me to divide our stay into two parts, sharing what we did each day of our stay. Besides, I took more than enough pictures to fill several posts! When we arrive at a new destination, we usually just chill out and research what we’re going to do during our stay. But here we already had lots of ideas from Wheelingit‘s 4-part series and Raven and Chickadee‘s post, so we were already off to a good start. 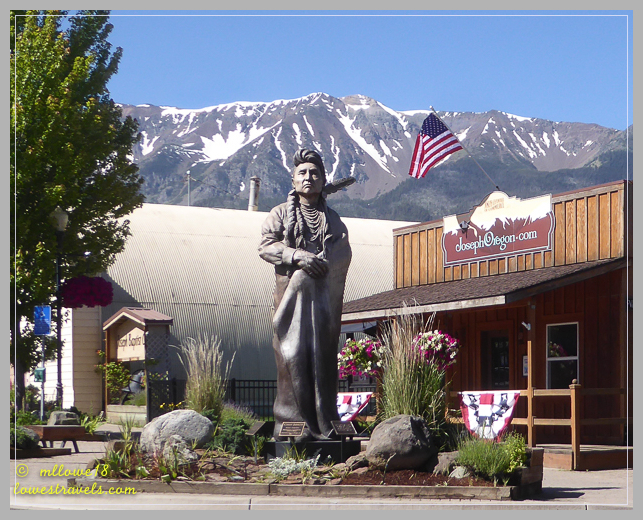 Minutes after completing our setup we drove to Joseph to discover what the allure of this little town nestled at the base of the Wallowa Mountains was all about. OK, we like this place already! 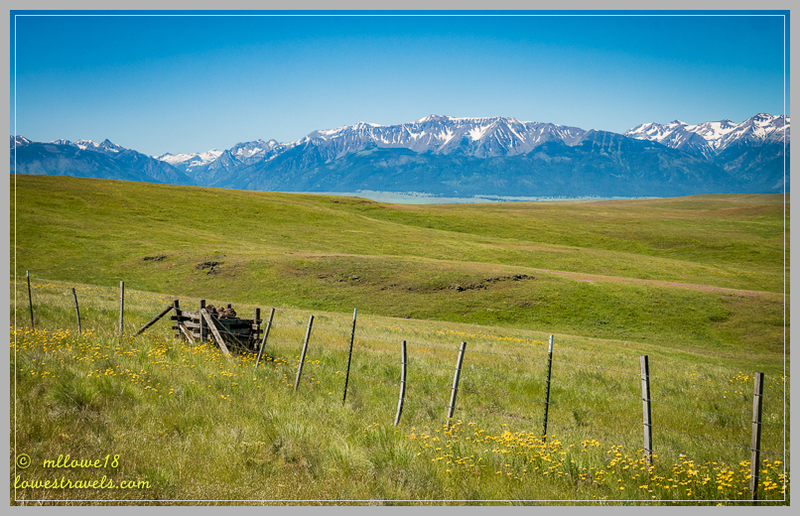 The town of Joseph is named after elder Chief Joseph, who was an esteemed leader of a band of the Nez Perce Tribe. We strolled through downtown in just a few minutes – it’s that small. So many things captured our eyes; life-size bronze sculptures, hanging flower baskets lining the streets and art studios all around. Although full of tourists, the vibe we got was simply of a small-town with many activities available nearby. After ogling the many bronze statues adorning town, my body was gravitationally pulled through the front door of Arrowhead Chocolates – resistance was futile! Steve enjoyed a cup of delicious spicy Mexican Coffee, while I drooled over a decadent spicy Mexican Mocha…heaven! 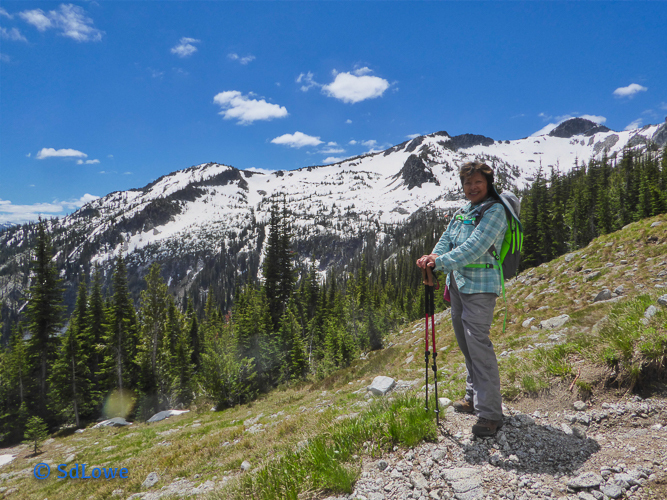 Day 2 – Maxwell Lake, or not! 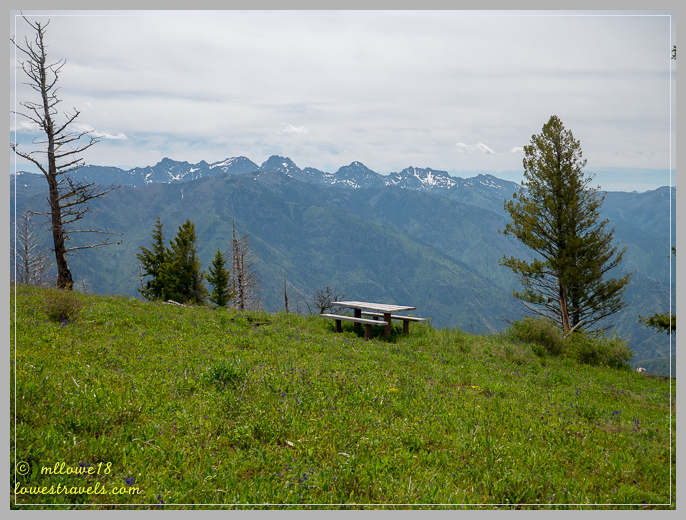 We quickly learned that most trails in the Wallowas are long and steep, and access to them is via dusty gravel roads. On our second day we opted to tackle the Maxwell Lake trail, nestled in a bowl of granite mountains. It began with a series of switchbacks for about three miles, then abruptly turned into a steep incline. The trail lead into fairly deep snow, and we eventually figured out that the lack of prior footprints meant we were done for the day. So we didn’t actually make it to the alpine lake, but we did get an excellent workout on a beautiful 9-mile roundtrip trek with a 2,500′ elevation gain. Getting up super-early, we packed lunch, topped off our fuel, and headed toward the long dusty road to hell. Hell’s Canyon, that is! 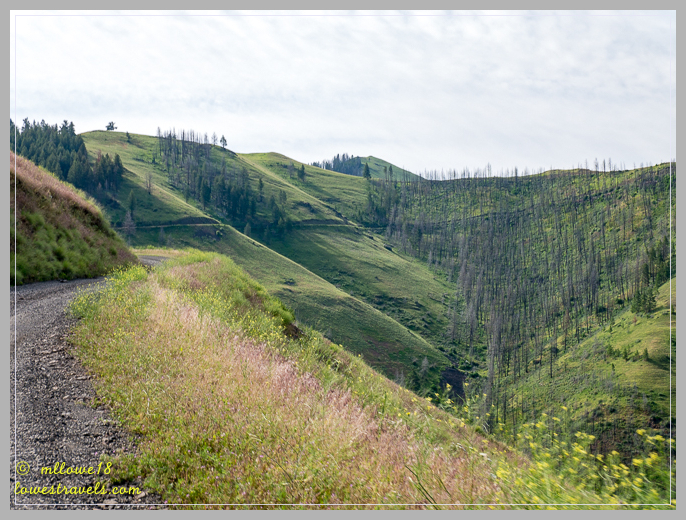 The gravel road began at “downtown” Imnaha, and we followed the steep (up to 16% grade) and sometimes single-lane road for about 6 miles. This was the most challenging section, but definitely do-able with a standard-height 2-wheel drive vehicle. After that it was a fairly easy jaunt on a well-maintained forest gravel road for the next 18 miles to Hat Point Overlook. 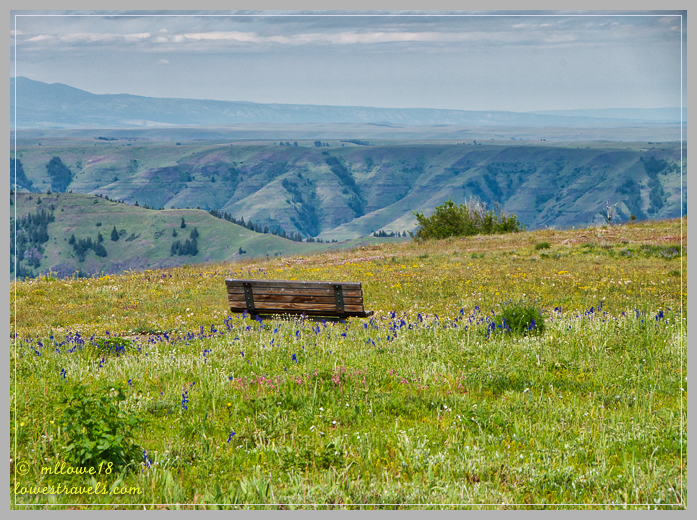 The views along the entire drive were stunning, with wildflowers coloring the hillsides as a bonus! 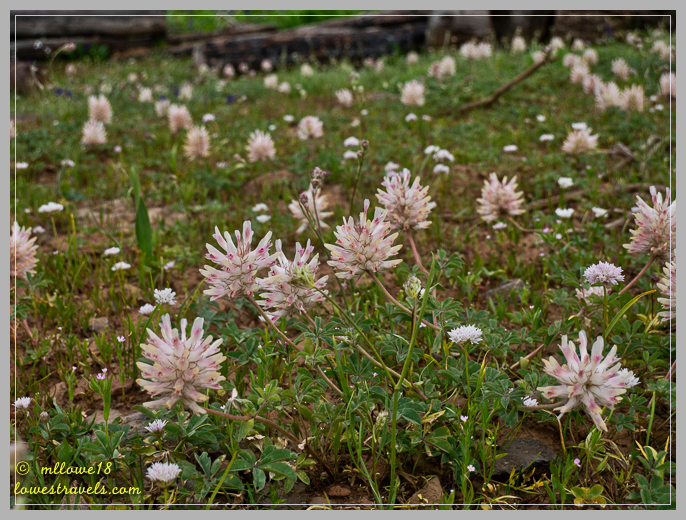 The hillsides were alive with colorful flowers, my camera was in overdrive! So hard to pick where to stop for lunch! 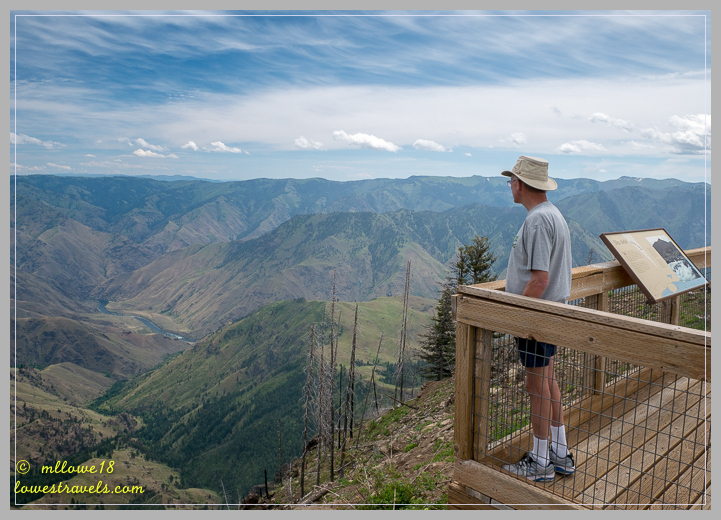 At Hat Point Overlook we saw a vast swath of Oregon and Idaho at the deepest river-carved gorge in the U.S. 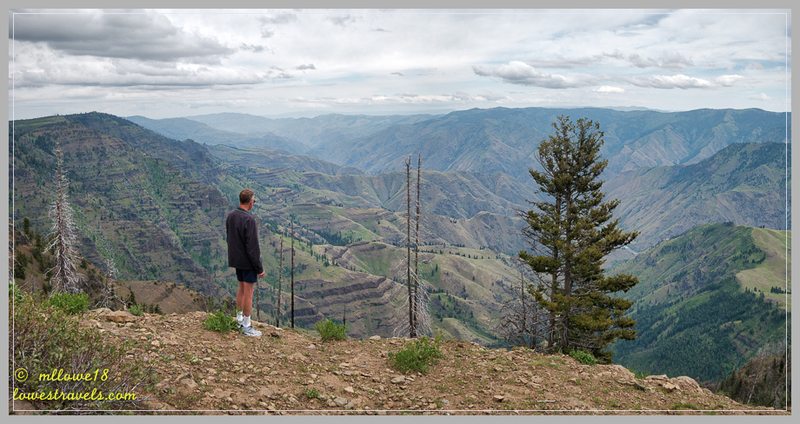 Created by the Snake River, Hells Canyon plunges more than a mile below Oregon’s west rim, and 8,000′ below snowcapped He Devil Peak of Idaho’s Seven Devils Mountains. And what a view! 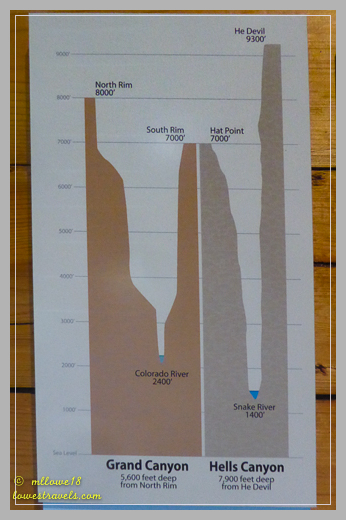 The Seven Devils Mountains across the Snake River in Idaho rise to 9,300′, making the depth of the gorge nearly 8,000′. 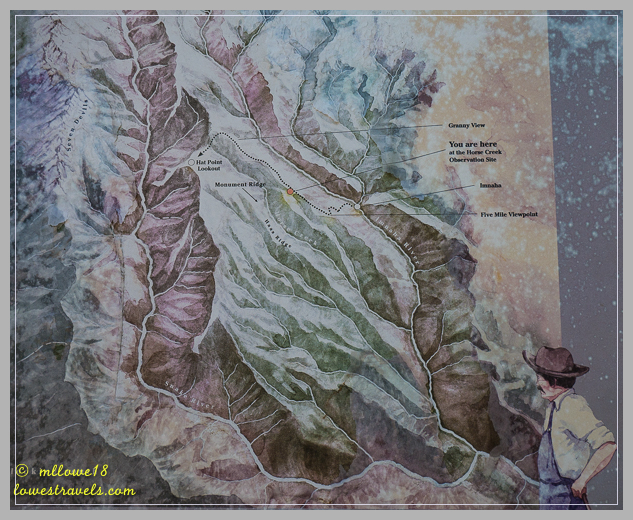 According to the NFS, the canyon was created from uplifting deep in the earth’s core that formed the Seven Devils and Eagle Cap Mountains, a process that continues today. The canyon itself is a result of both uplifting and erosion by the river. The Snake River marks the state line between Idaho and Oregon. There’s no way to convey the vastness this picture shows – you must be here! 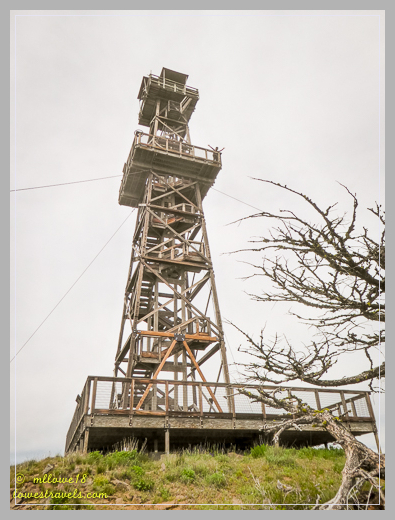 We climbed the 82′ tall Fire Tower for more views from the top. Can you see me? Now this is lunch with a view! It was a long day of driving and gawking at the incredible canyons and wildflowers, and the effort was definitely well worth it. 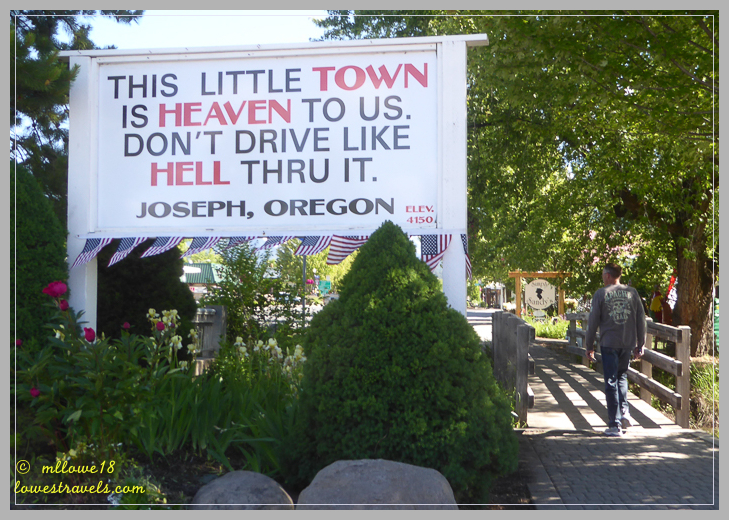 If you ever visit Joseph or this part of northeastern Oregon it would be a shame to miss it. One final look at hell? We don’t think so! 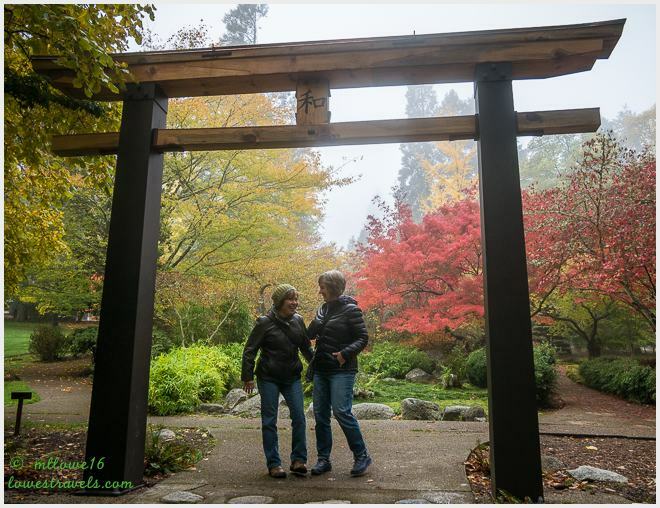 Rain continued to accompany us on our travel days as we headed down to Grants Pass, Oregon. This was our third visit here. It’s where Henderson’s Line-up is located, the place we go for repairs and upgrades on Betsy’s chassis suspension. On our way to Alaska in 2012 we had several upgrades performed, including the installation of Koni shocks, a Supersteer Bell Crank, a Safe-T-Plus steering unit and Motion Control Units for our air suspension. This time through we just wanted to have everything checked out and get another 4-corner weigh performed. Betsy passed with flying colors – yay! 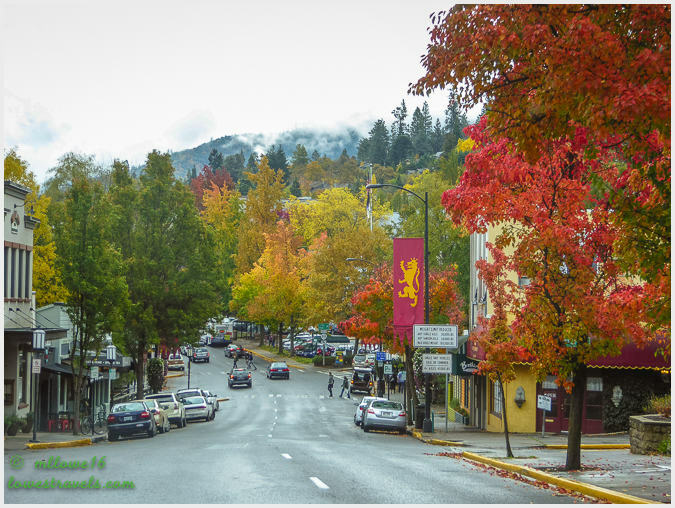 The next day we continued south to Ashland, our final stop in Oregon. This cool town is Eric and Laurel’s hometown, and we were excited to see them after two years. 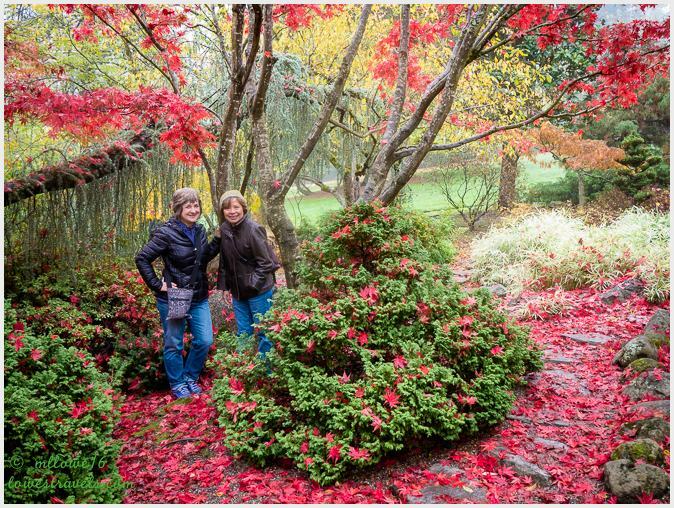 Both of them are nature lovers and avid birders – as indicated by the name of their blog site – “Raven and Chickadee”. 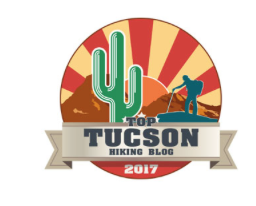 Among other things, we all enjoy the same outdoor activities like biking, hiking and especially birding. Eric knows his birds, and I learned a lot from him during our birding extravaganza on Dauphin Island, Alabama. We were looking forward to doing some hiking and/or birding during this visit, but the weather was not cooperating. 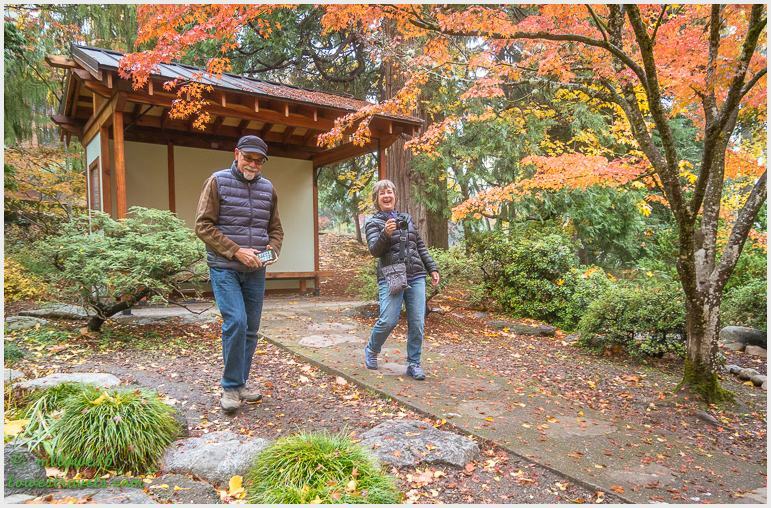 Instead, they gave us a walking tour around town and through Lithia Park, one of Eric’s “offices” during his working years. This park is the largest and most centrally-located in Ashland, and was listed on the National Register of Historic Places in 1982. 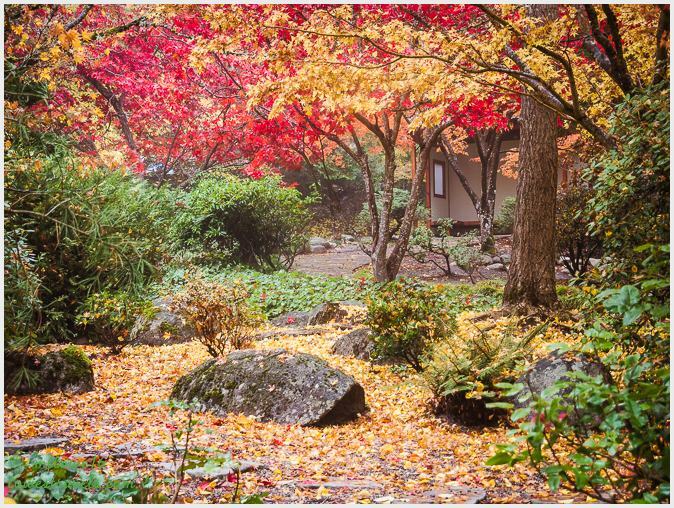 Eric confirmed we came at the perfect time, as the fall foliage at the Japanese Garden was at its peak. We were so busy enjoying the colors and good conversation during our walk that we didn’t even realize we’d covered four miles! 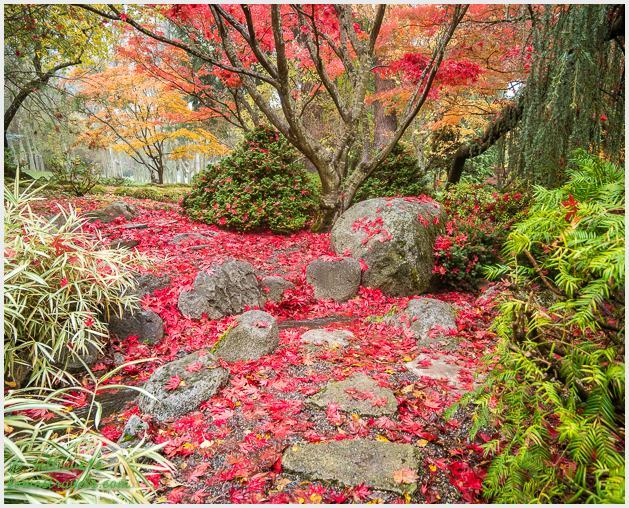 The Japanese Garden was amazing, and Eric helped build this awesome place! Eric and Laurel were terrific hosts, and as always we enjoyed spending the short time we had with them. Their love of nature, outdoor fun and music (Laurel plays the guitar) mesh well with our interests, and we always have a good time together. Thank you Eric and Laurel for the guided tour. Though our visit was too short we had a blast! Our reservation at Emigration Lake (Steve’s review here) was originally for five nights, but we had to cut it short due to sad news in California. We high-tailed it back to the Bay Area and didn’t get to say the kind of goodbye’s we wanted to, but sometimes that’s the way things go and we’re hoping to cross paths with our friends down the road. As of this writing we’re in California, bonding with family and visiting old friends until the end of the year. Blogging will have to take a backseat for a while, so we’ll take this opportunity to wish all of you a Happy Holidays! Besides the previously-reported interior modifications we had done to our coach at Dave and LJ’s Interior Design, some other mundane mechanical issues needed to be addressed as well. 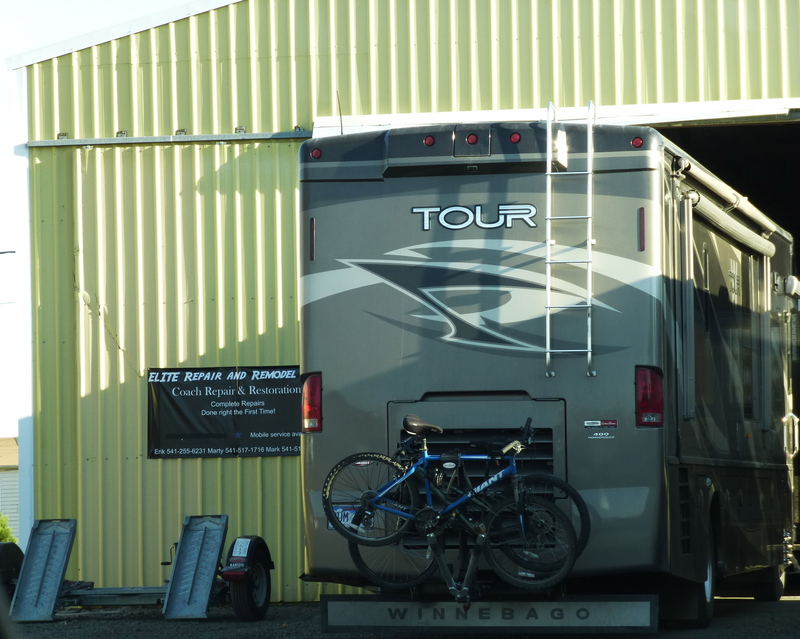 Southern Oregon seems to be a mecca for quality RV maintenance and repair shops, perhaps because it’s an area where several RV manufacturers reside. We took a tour of the Marathon Coach factory in Eugene, which is where “high-end” coaches are built at $1,000,000+ per unit. But some other manufacturers either used to or continue to build coaches here. The result is that there are several shops around with highly-qualified mechanics to perform engine, chassis and coach repairs. 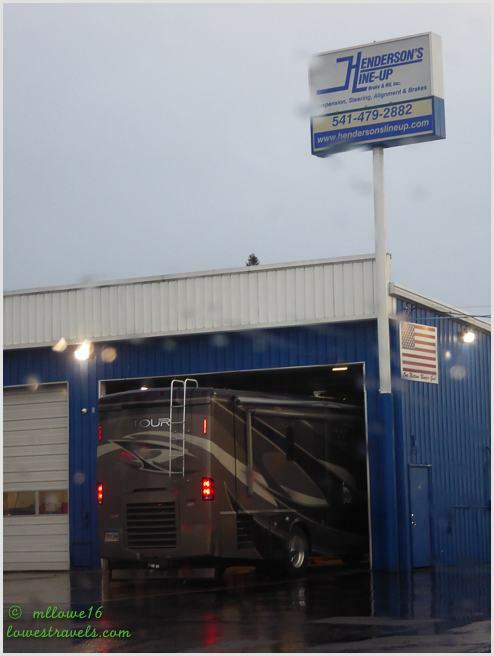 We stopped in Harrisburg specifically to have Elite Repair and Remodel take a look at our vexing air bag problem. Our air suspension is supposed to deflate when we level the coach, which lowers it several inches before the hydraulic jacks extend. Ours has NEVER worked, and the dealer did not even report to us that there was a problem when we took the coach in for a related repair. Marty at Elite tracked down the issue to a wiring harness that was never plugged in when the coach was built. As we’ve been told before by our friends at Wheeling It, these guys are GOOD. Marty fixed the air bags and checked out our slides in less three hours – highly recommended! Next, we returned to Henderson’s Line-Up in Grants Pass to have Betsy’s alignment and suspension checked following the grueling drive on Canada’s and Alaska’s worst roads. The upgrades they made in April held up fine and everything checked out. 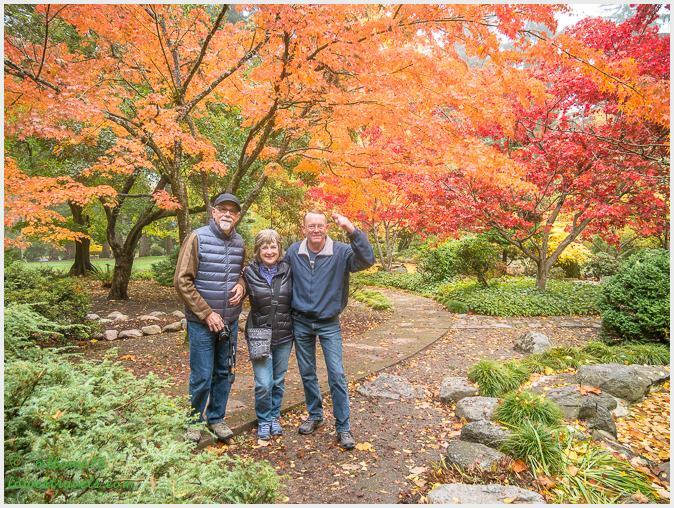 Henderson’s Line-Up – another quality business here in southern Oregon. 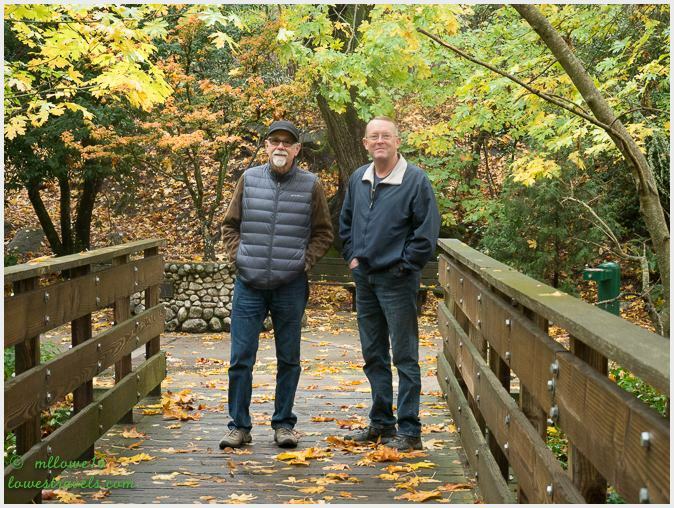 While in Grant’s Pass, we stayed 3 nights in one of Steve’s favorite RV Parks, the River Park RV Resort along the Rogue River. Nice and quiet with lots of big trees. We took a 6.5 mile walk along the river by following the Rogue River Greenway Trail where blackberries abound. At the trailhead was the Depot Street Bridge where for the first time we saw a bench actually on the bridge for looking out to the river. Maybe there are no jumpers at Rogue River. We also got in some quality reading time and the fall weather was fantastic! Steve is smiling for he can now check one off from his bucket list, the Columbia River Gorge. The Columbia River Gorge is an impressive river canyon carved by the Columbia river as it flows into the Pacific Ocean. 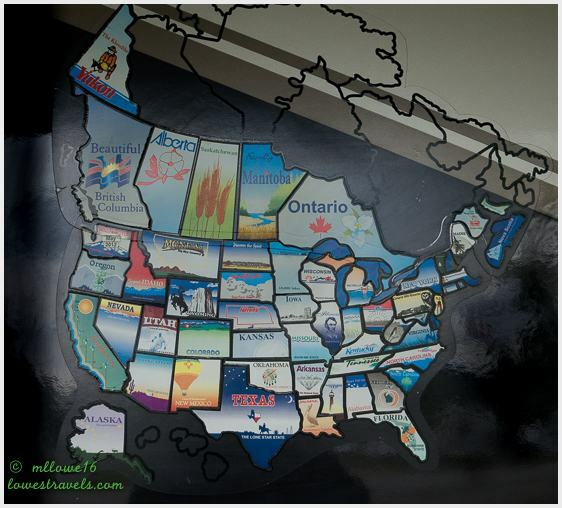 It stretches over 80 miles and is shared by the states of Washington and Oregon. 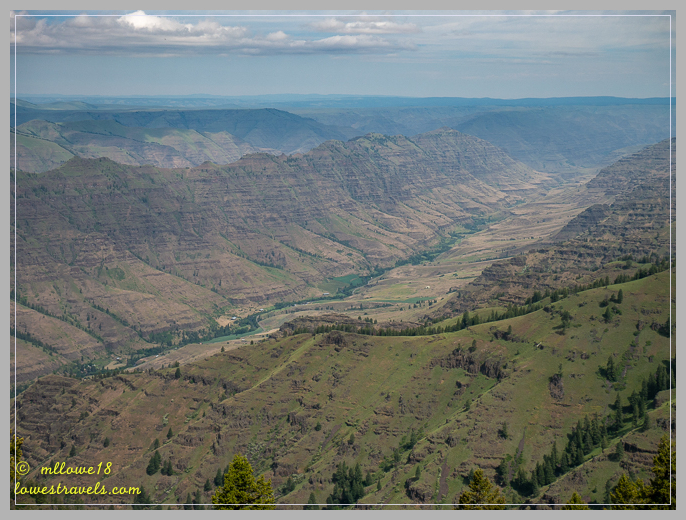 Mt Adams to the north and Mt Hood to the south flank the gorge and the mighty Columbia River runs through its middle. The bridges that connects the states are: The Dalles to the east, the Hood River in the middle and the Bridge of the Gods to the west. The Gorge is recognized as a destination for exploring the natural beauty and cultural richness of the Pacific Northwest. 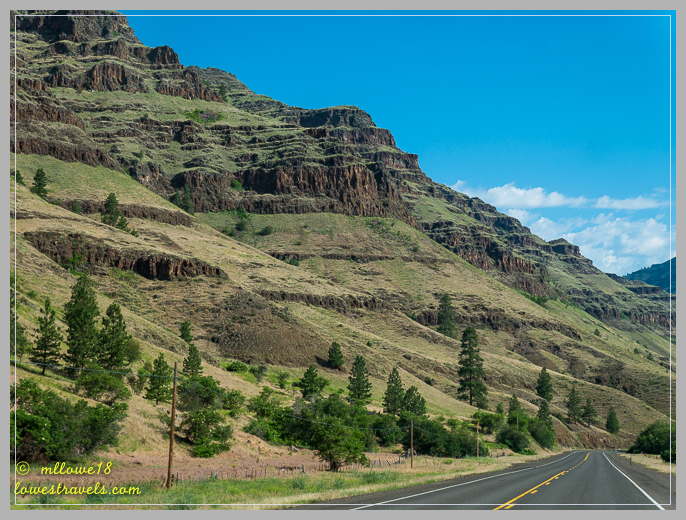 Geologists must love this place with all its cliffs, rock formations and rugged terrain. 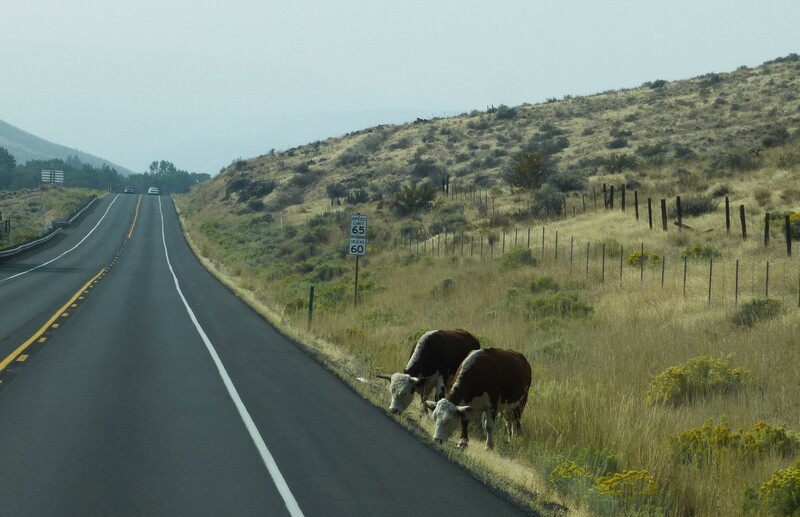 The only wildlife seen on the highway on our way to the Gorge. 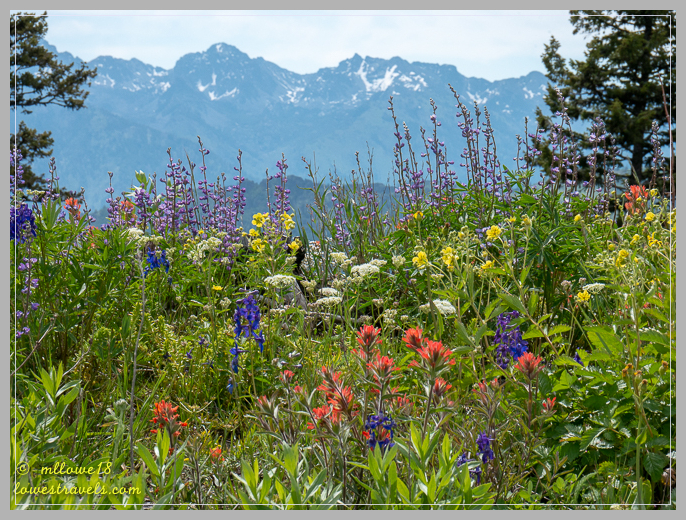 We spent a whole week exploring and enjoying the gorgeousness while staying at White Salmon on the WA side as our base camp. 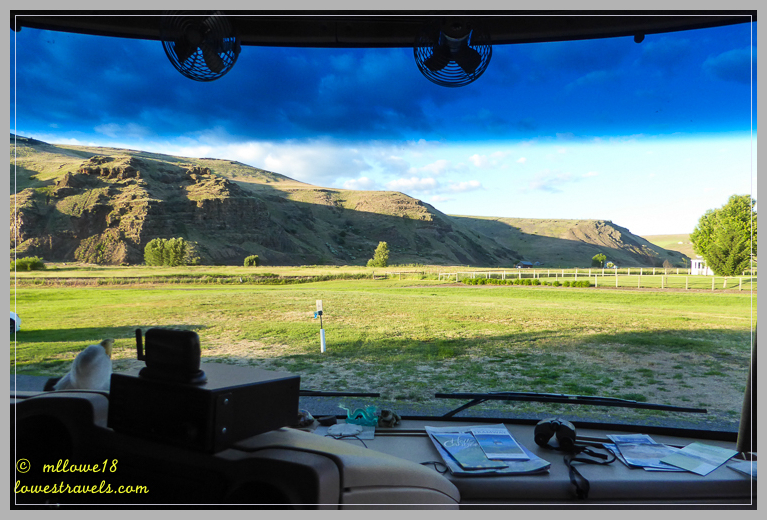 During our stay, we weaved in and out of Washington and Oregon through their $1.00 toll bridges and drove from east to west by taking highway 14 on the Washington shore and 84 on the Oregon side. We had an action-packed week and we loved it despite some hazy and smoky days. What did we learn and enjoy? Plenty ! 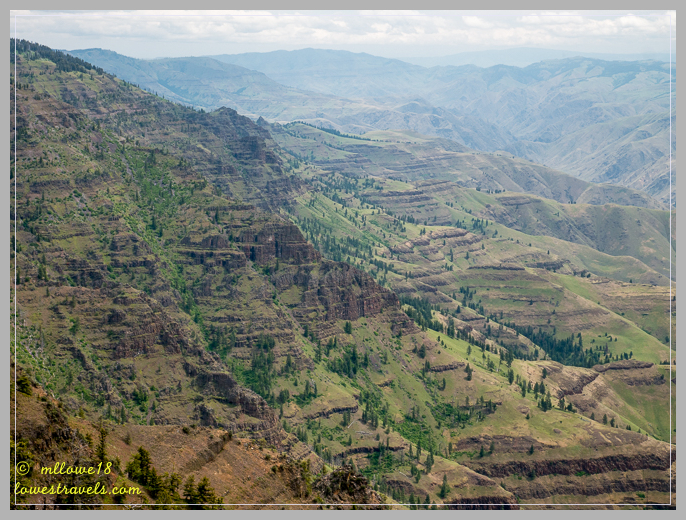 and so we will have more than one post to talk about the gorgeous gorge. Lets start with the waterfalls. Oregon has 77 waterfalls and the Gorge contains the greatest concentration of waterfalls in North America. These spectacular waterfalls are all within approximately a 15-mile stretch! Traveling along the Historic Columbia River Highway 30 on the Oregon side of the Gorge, we were able to view five different waterfalls cascading over the walls of the Gorge. Our trek began at the Latourell Falls which is usually the first waterfall seen along the Columbia Gorge Scenic Highway if coming from the west. The falls plunge 224 feet over a massive wall of columnar basalt – some of the best formations in the Pacific Northwest – before cascading hastily towards the Columbia River. 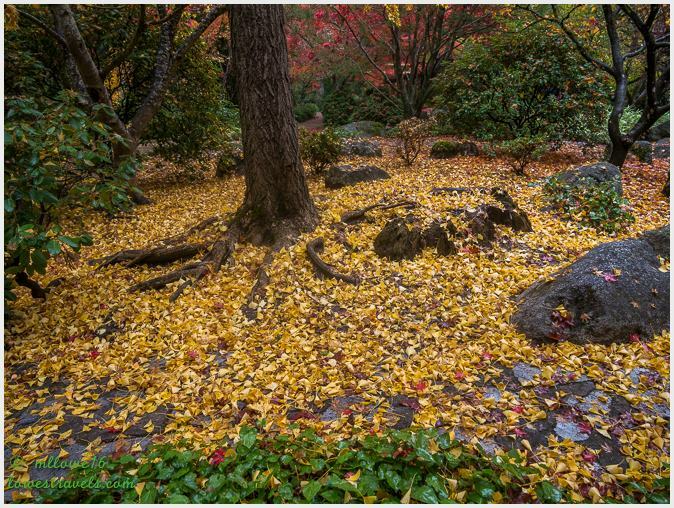 What was distinctive to this fall is the large patch of bright yellow lichen adorning the cliff face to the right of the falls, and maybe because of this we saw several photographers in the area. Next stop was the Shepperds’ Dell Falls. Though looking straight down from the bridge will allow one to see the two final drops, only the 45 foot tier and a pair of the small cascades above it are clearly visible. 3.5 miles later we park our car and hiked for about 2.2 miles roundtrip to get to the base of the Bridal Veil falls, considered as the most pristine among the waterfalls in the area. This two tiered falls are the only in the area which occurs below the historic Columbia Gorge Scenic Highway – the base of the falls standing probably no more than 20 vertical feet above the Columbia River. Continuing on the drive the next stop was Wahkeena falls. At 242 feet, it can be seen from the Wahkeena picnic area across the Historic Highway and is the most scenic waterfall along the historic Columbia Gorge Scenic Highway. It is unique among the major waterfalls in this section of the Gorge in that it possesses a significant alluvial fan in both size and elevation. Then about half a mile later is where the most visited natural attraction in Oregon is located, the Multnomah Falls. It is the highest waterfall in the Columbia River Gorge with a total drop of 620 feet. We did a 2.5 mile hike up to the top of the falls with 11 switchbacks and a 650 foot elevation gain. Although the top was not as spectacular as we expected, the hike was a good workout. Top of Multnomah Falls, spot the tourists looking up, can you see them? Our final viewing of waterfalls along the historic highway was the Horsetail Falls. This one is considered pretty much the epitome of the Horsetail form with views from 180 degrees around the falls. The above beauties were all accessible from the highway, two other waterfalls that we located and viewed required quite a hike. Both Metlako Falls and Punchbowl are located along the Eagle Creek trail in the Columbia River Gorge National Scenic area. Metlako Falls drop out of a narrow, calm pool, and thunder into an impressive gorge. The Punch Bowl falls occur where Eagle Creek cuts through a narrow channel flanked by cliffs, and shoots powerfully into a large bowl. The falls’ name is a very descriptive one, as it’s easy to see it’s resemblance to an actual bowl you’d pour punch into. And we viewed what we can in one long day, but did we see them all ? Nope, we missed two along the historic highway Oneonta and Elowah Falls (not sure why we overlooked them). Are they not all beautiful? We arrived in Astoria in the afternoon bringing sunshine with us. On the Oregon Coast at this time of the year a sunshine day is a blissful occurrence. After setting up we explored Astoria which is also known as “Little San Francisco,” and coming from “The City” myself this town is indeed little. No visit to the Oregon north coast is complete without a stop at the Astoria Column. It stands 125 feet tall, and took us 164 winding steps to the top and the view is “wow”. 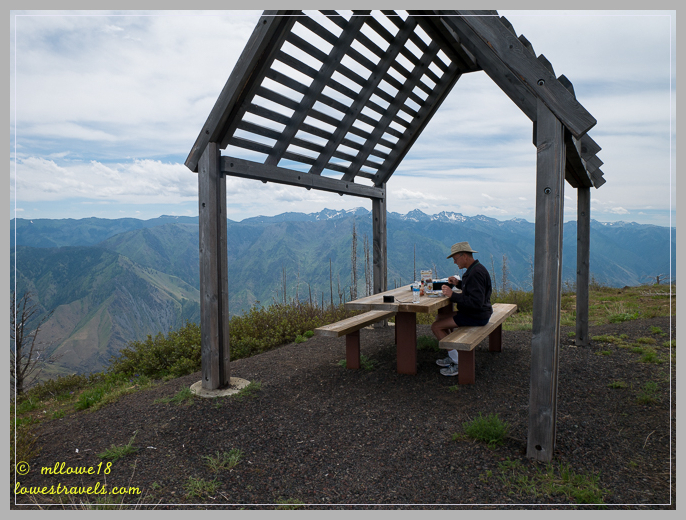 It was cold and windy when we got there so we only stayed at the top for a few minutes to enjoy the panoramic view of the Columbia river, the Pacific Ocean, city of Astoria and the mountain ranges of Oregon and Washington. Also the Astoria -Megler bridge that connects Astoria to Washington state is clearly visible. We have also checked out the historic town of Astoria and followed the Astoria River Walk which parallels the Columbia river. 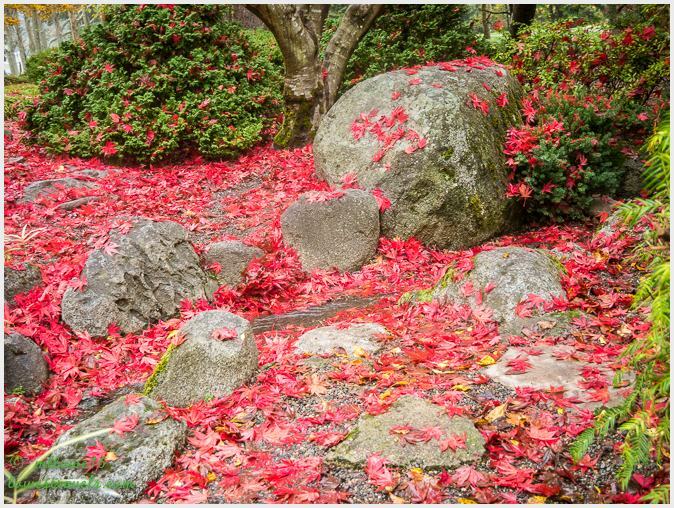 Along this walk you will see the Columbia River Maritime Museum, the Maritime Memorial and it winds past statues, old canneries, abandoned docks, and new shops and cafés. On this walk we passed by a small fishing store where we grabbed a fresh crab cocktail. Yum ! Across from the Columbia River Maritime Museum is where we had the best fish and chips ever at a little land-based boat called the Bowpicker. We don’t eat much fried food, but these guys use fresh Albacore tuna and steak fries for their Fish and Chips. It was the best we’ve ever had! Finally, we checked out the Ft. Stevens State Park. 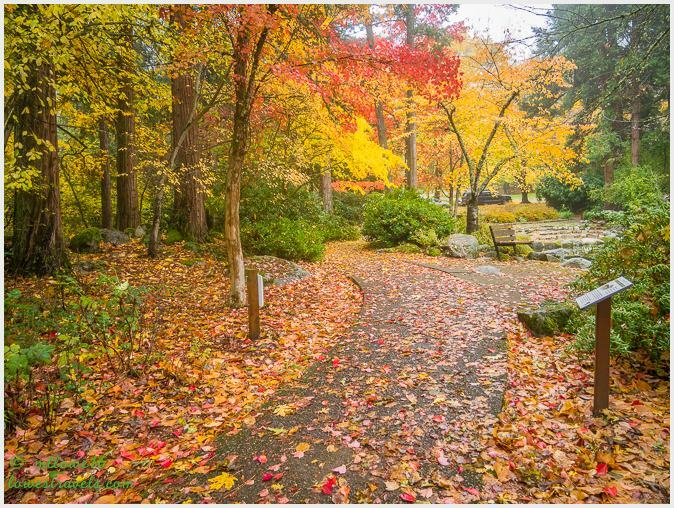 It is the largest state park in Oregon, over 1,800 acres. We rode down their 9 miles of paths, listening to the ocean and wild birds along the way. What a fantastic bike ride! This bike path gets a “10” in our book for sure! How about a ride where you see a piece of history (a shipwreck), a beautiful fishing lake and the pacific ocean all within less than a mile of each other – and yellow flowers lining the trail and wooded areas along the way! There is so much to see in so little time. We missed a few interesting places but we must move on. Astoria is the last Oregon coastal town that we will visit on this trip segment. Albacore Tuna fish and steak fries, the best fish and chips ever! Being at the Oregon Coast walking on the beach is mandatory especially at Bandon Beach which stretches about 3 miles with some unique and stunning views. Today the clouds finally gave way to the sun, Steve and I walked along the beach and enjoyed the views and explored several rock formations. Check the photos if you can discern Face Rock, Cat and Kittens Rock, Table Rock and Elephant Rock. We also stopped by the Bullards Beach State Park which has 4.5 miles of open beach to explore. We walked across the river to get up close with the most picturesque and most photographic landmark of the area, Coquille River Lighthouse. 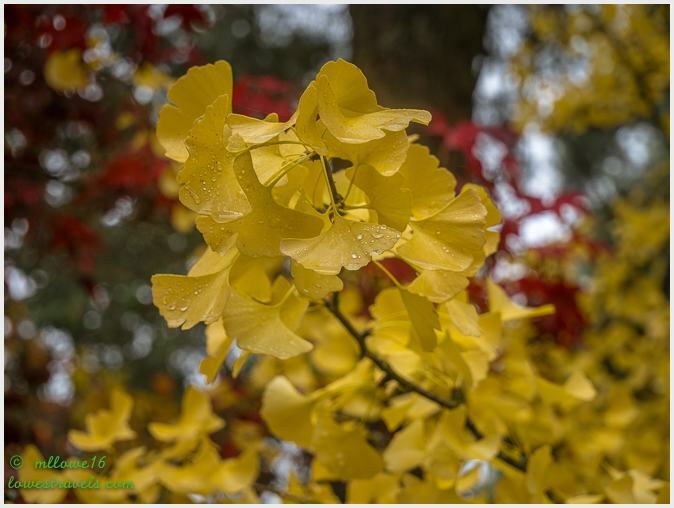 These yellow flowers are all over town, at the beach and roadside everywhere.